Roll and smash! Tilt and guide your bowling ball down an obstacle course to avoid traps, jump on ramps, collect glowing stars, and smash pins. 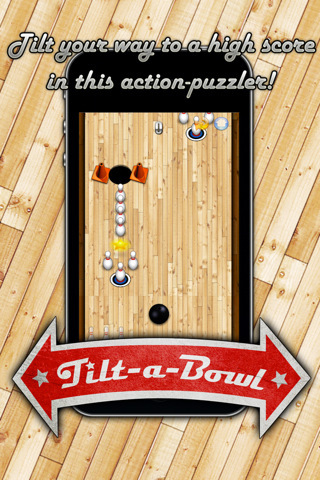 Released by NO2 Games as a universal app, Tilt-a-Bowl is available for $0.99 and works on the iPhone, iPad and iPod touch. This review is based on the iPhone 3GS version. When I first took a run at Tilt-a-Bowl, the game was immediately accessible. Control the bowling ball through tilting and avoid traffic cones and the gutter at the edge of the screen. 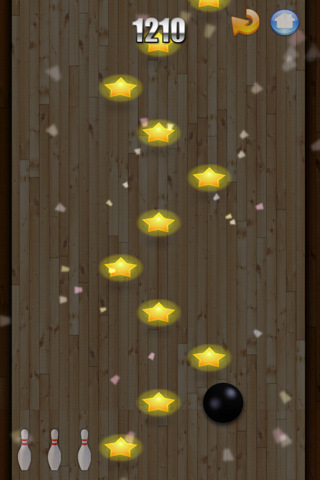 The goal of most levels is to collect all the stars and hit all the pins. If you miss too many pins, you lose. The trickiest parts come when the pins are on opposite sides of the lane and you can end up over-steering your bowling ball into the gutter. The simplicity in controls makes this a no-touch style of gameplay and it definitely helps. You have an alternative control scheme of controlling with your finger but I find this loose and unwieldy since the ball has a delay from when you move your finger. No, it’s not a glitch, it’s a design choice and in my opinion, it’s a design flaw. The graphics really hit home for me thanks to its banners, bright clean colors, and good use of 3D. The top-down camera perspective is nice, but it makes knowing what’s coming nearly impossible per level, boiling the gameplay to repetition. If they angled the camera so you can see further down the lanes, it would help immensely and it would add a visual flair to the game. As it is, it’s still easy enough to play. Not much to say about Tilt-a-Bowl. It’s a simply to understand, really hard-to-master style game app. The art is very retro, the controls are solid (so long as you stick to tilt), and the levels are challenging and fast to play. I found the music to actually be pretty good and the theme matches well. Give Tilt-a-Bowl a try and see how good you are! AppSafari review of Tilt-a-Bowl was written by Joseph Ho on June 30th, 2011 and categorized under App Store, Games, iPad apps, Sports, Strategy, Universal. Page viewed 3868 times, 2 so far today. Need help on using these apps? Please read the Help Page.